Although all new petrol engine vehicles currently manufactured utilise the Electronic Throttle Body control system for both acceleration control and Idle stability, there are millions of vehicles still driving the streets that are fitted with a separate Idle control system that still requires servicing, testing and renewing and the occasional resetting. We are looking at the characteristics of two of the most common systems used, which are the ECU operated Idle Air Control (IAC) control system and the Stepper Motor Idle speed control. 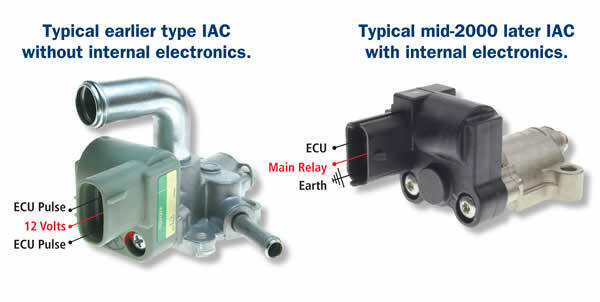 IAC – Idle Air Control. This was a widely used system in the industry (generally local and Japanese vehicles) and because of its location on the throttle body can be problematic due to carbon build-up creating insufficient or excess idle speed. It has a “spring return” for the internal air control valve that retains to the base idle position when electrically disconnected or when not activated. It is generally duty cycle pulsed by the ECU to move the internal control valve. Some units may or may not have internal electronic circuitry, which make replacing with the correct unit important. Some may, or may not, be adjustable. Common Faults on this type of IAC. Note: High Idle speed may cause hunting at idle only. Ensure correct test procedure for the unit being tested. This was a commonly used system found in vehicles from all corners of the world. Typically, the V6 and V8 GM vehicles utilised a simple stepper motor system that is operated by the ECU in small steps to open and restrict the idle bypass passage at the throttle body. Disconnected - until it is reconnected. It “does not” revert to a base position as the IAC valve does. A fully extended pintle creating a fully closed passage (Base idle position) would have a diagnostic scanner reading of Zero steps. Contracting the pintle to a fully open position would then indicate approx. 255 steps on the scanner. Neither of these positions are suitable for idle. The ECU will generally move the pintle to a position where there is sufficient air intake for a stable idle. A typical “hot idle step reading” displayed by a scanner on a system without major vacuum leaks or carbon build up would indicate near 25 steps. Any major variation would require close attention to these areas. Common faults on this type of Idle control system. Stepper motor windings open/short circuit. Like the IAC motor, carbon build up can be problematic. It is important to fit the correct unit as many smaller pintle units may fully unwind from the motor. Many of the Stepper motors are integrated in a housing with a coolant temperature activated Auxiliary air control valve. This can be problematic with age, as the alloy housings corrode and coolant under pressure enters the stepper motor windings. 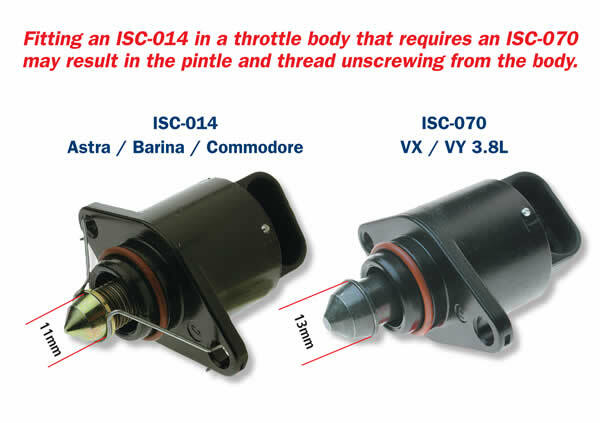 A short circuit windings condition occurs and may damage the stepper motor circuit in the ECU. It is important to be aware of these precautions. Generally, a reset procedure is required on many of these combined stepper motor and auxiliary valve assemblies.